ZARAGOZA, Spain, Sept 15 (Reuters) - Ukrainian Sergey Outschakov won a Tour of Spain stage for the first time in six years on Wednesday. The TVM rider sprinted to victory in the 183.2-km 10th stage, started and finished in Zaragoza, just beating off the challenge of Italy's Fabio Roscioli. Outschakov clocked four hours 23 minutes 57 seconds for the last flat stage before the riders hit the Pyrenees and endure three days of continuous climbing. ``I still can't believe it, `` an elated Outscahkov said. ONCE rider Abraham Olano finished 17th in the following peloton to retain the leader's golden jersey. Outscahkov's arms were revolving like windmills in celebration as he crossed the line and he admitted his head was still whirling several minutes later. ``All through the stage I was thinking that the countryside looks like that around Bergamo in Italy where I have spent much of the last seven years. So I want to dedicate this victory to all my family and friends there,'' he added. He said the TVM riders had been desperate for a stage victory on Wednesday to boost the team's flagging morale. They had hoped, before the Tour, that team leader Jeroen Blijevens was going to make an impact but the Dutchman has been carrying a cold for several days and unable to perform at his best. ``We were hoping to put him in a position where he could win but he has been suffering from various things,'' Outschakov said. The Ukrainian has been nursing Blijevens but on Wednesday he was released from the duties of fetching-and-carrying and allowed to ride his own race. The leading pair broke clear from a group of five riders nine kilometres from the finish. After working together to ensure they would be first and second across the line, the pair had their own private battle for the stage honours in the final 200 metres. France's Jacky Durand, who had driven the initial break after 39 kms with Outschakov, came home third 13 seconds behind. The 80-strong peloton swarmed home 28 seconds in arrears. With all the leading protagonists in the overall standings finishing in the main pack, there was no change in the top 15 places and Olano retained the lead for a sixth successive day. ``I was just looking to be inconspicuous in the peloton,'' Olano admitted. He conceded the next three days in the mountains could leave his two minutes eight second lead badly exposed to some of the leading climbers but remains optimistic that he can leave the Pyrenees still in pole position. LOS CORRALES DE BUELNA, Spain, Sept 13 (Reuters) - France's Laurent Brochard won the Tour of Spain's ninth stage between Gijon and Los Corrales de Buelna on Monday, despite the driving rain which caused the local authorities to issue emergency flood warnings along parts of the route. Brochard also shrugged off the fatigue of the previous day's tough mountain stage, where he trailed in more than 17 minutes behind the winner, to notch his first victory on a major Tour. The Festina rider, banned for six months last year for doping offences, clocked a time of four hours 33 minutes 40 seconds for the 185.8 km ride and managed the first successful break on a flat stage in this year's race. All previous attempts to get away from the pack had failed but on this occasion, the weary peloton was content to let a group of 12 riders make the pace throughout the day. Climbing up the final mountain, less than 20 km from the finish, the group still had a lead of more than three minutes before Brochard decided to forge ahead alone. ``Winning my first ever stage on a big Tour is very important for me, especially after everything that has happened in the past year. Now I can forget all about it,'' Brochard said. ``The final stretch was very difficult for me because of the continuing climbs and drops as well as the incessant rain which made the roads and the descents very dangerous,'' the pony-tailed rider added. Brochard was one of the Festina team riders who were banned following last year's Tour de France doping scandal in which team members admitted using performance-enhancing drugs. He completed a six-month suspension from the sport in April. The Frenchman's victory had a certain irony to it coming on the day when he was raised out of bed at seven in the morning to provide a blood sample for the International Cycling Union (UCI) doping team. The UCI drug detection flying squad -- nicknamed 'The Vampires' by riders on the Tour -- tested 39 riders from seven teams. None were positive. Coming home just three seconds in arrears of Brochard, after closing rapidly in the final kilometres, was a group of four riders lead by Swiss world road race champion Oscar Camenzind, of the Lampre team. Spanish race leader Abraham Olano came home 16th, three minutes 14 seconds behind Brochard, but only a few of the men in front of him were able to claw back any of their deficit on the overall rankings. The ONCE rider will carry on in the golden jersey for a fifth stage, after Tuesday's rest day. Olano rode home alongside Germany's Jan Ullrich and he retained his 2:08 advantage over the 1997 Tour de France winner, who lies second in the race standings. ALTO DE L'ANGLIRU, Spain, Sept 12 (Reuters) - Jose Maria Jimenez again proved his mettle as a fine climber by taking the Tour of Spain's tough 175.6-km eighth stage between Leon and Alto De L'Angliru on Sunday. Jimenez trailed Russia's Pavel Tonkov by nearly a minute at the checkpoint three kilometres from the summit finish but in the last kilometre the Banesto rider poured on the power to overtake Tonkov in the final few metres. The pair emerged from the mist-shrouded the mountain top and turned the final corner shoulder-to-shoulder. But it was the Spaniard who had more left in his legs after an energy-sapping 13-km climb with gradients often exceeding 20 per cent. Many riders, including Jimenez, had described the stage as the toughest they had ever encountered on a major tour. Jimenez, who has now taken over as the Banesto team leader after the below-par showing of Swiss rider Alex Zuelle, stopped the clock after four hours 52 minutes and four seconds in the saddle. Tonkov was given the same time. Two relatively flat stages and a rest day beckon before the Tour reaches the Pyrenees where Jimenez will again be able to show his strength. However, he is cautious about whether he can close the gap on his compatriot and former team mate Abraham Olano, who retained his race leader's golden jersey after finishing fifth on Sunday. Olano now has a two minute advantage over Germany's Jan Ullrich while Jimenez currently lies seventh. ``At this stage in the race it will be very difficult to predict whether I can overtake Olano. We'll see how things go after we have left Andorra,'' Jimenez said. Olano exceeded everbody's expectations by finishing only one minute and 44 seconds in arrears of the man who sheperded him through the mountains and to the 1998 Tour of Spain crown when the pair were on the same team last year. Plucky Olano finished the race with blood oozing from several cuts on his legs after an earlier crash when he plunged two metres down a verge and into the undergrowth. He emerged unharmed after a few worrying seconds and was hauled back onto the road by helpers. Like Jimenez, with 13 stages still to go, he was not in the mood to suggest he can still be wearing the golden jersey when the race reaches Madrid. ``It was a good ride but there are still too many mountains to say whether I can win this race. It all depends on how I recover,'' Olano said. Spain's Fernando Escartin crashed in the driving rain after 138-km while on the descent from the summit of the first mountain, Alto de la Cobertoria. Escartin, who rides for Kelme and is a noted climber, was one of the pre-race favourites but had to retire after suffering injuries to his chest and collarbone. Another man to retire was Belgium's Peter van Petegem, the winner of this year's Tour of Flanders and the 1998 World Championship road race silver medallist. LEON, Spain, Sept 11 (Reuters) - Germany's Marcel Wust fulfilled a promise and returned to the Tour of Spain victory podium after his fourth stage win of the race on Saturday. The Festina rider's winning streak of three consecutive stage victories came to an end when compatriot Jan Ullrich took Thursday's stage. Spain's Abraham Olano relieved him of the race leader's golden jersey on the same day but Wust showed that the Tour was far from over for him. ``I said I would be back,'' Wust joked. He took the flat 217-km seventh stage between Salamanca and Leon in the final few metres in typical fashion, edging in front of the huge pack of riders all racing for the line. His three previous stage victories came from similar tactics and his biggest winning margin has been barely a bike length. ``I have always thought I was the best sprinter on this Tour and so this race was ideal for me. If this stage had been five metres shorter then I would not have been the winner but it wasn't and so I am,'' he said. Wust clocked four hours, 39 minutes and 35 seconds and the first 144 riders home were all given the same time. Again the Deutsche Telekom team tried to foil their Spanish-based compatriot but failed. They placed three riders at the head of the peloton, when the group was two kilometres from the line in Leon, in a bid to dictate the pace and strategy of the sprint finish. The German outfit tried to give a clear run to Danilo Hondo, who has recovered from a crash on the first stage when he finished with blood streaming from gashes on his head and arms. But Wust again outsmarted his rivals. ``I knew Hondo was the danger so I kept an eye on him,'' Wust said of his compatriot. Specialist sprinters filled the top 10 places on the day, with Australia's Robbie McEwan coming closest to beating Wust. The leading riders in the overall standings opted for a relatively easy day, hidden in the peloton, and generally did not make much effort to improve their position, with Sunday's brutal mountain stage beckoning. Olano, who rides for the local ONCE team, retained the overall race leader's golden jersey after finishing 27th. He kept his one minute and seven seconds advantage over Germany's Jan Ullrich, of Deutsche Telekom. American Bobby Julich crashed heavily 17 kms after the start, when several riders went down, and is out of the race. Julich, who finished third in the 1998 Tour de France, was taken away in an ambulance suffering from concussion and minor head injuries. He was later released from hospital swathed in bandages. He was walking and talking by then but was visibly disappointed after departing on a stretcher from his second major Tour this year. SALAMANCA, Spain, Sept 10 (Reuters) - Spain's Abraham Olano rode a brilliant time-trial to win the Tour of Spain's sixth stage on Friday and strengthen his overall race lead. Defending champion Olano, who rides for the local Once team, clocked 53 minutes and 32 seconds in the 46.4 km time-trial, which started and finished in the centre of Salamanca. He finished 57 seconds clear of second-placed Jan Ullrich, who won Thursday's fifth stage, to extend his overall lead to one minute and seven seconds over Germany's 1997 Tour de France winner. However it was a far from easy ride for the Spaniard, around a twisting and often bumpy circuit in sweltering heat. ``Sure it was a good time trail but I can hardly say I enjoyed it. There were plenty of difficult moments when I had problems maintaining my rythmn,'' Olano said. Nevertheless he gave little outward sign of the discomfort he was suffering. At the first 7 km checkpoint he went through 16 seconds faster than Ullrich, who has a habit of starting slowly. Ullrich, riding second to last and two minutes behind Olano, was expected to come through strongly and was well clean of any other challengers but could not close the deficit on the flying Olano. At 13 km Olano had stretched the lead over his German rival to 22 seconds. Ullrich continued to apply the pressure on the 171 riders who had started before him but still could do little to reel in Olano, who put his big effort into the third quarter of the time-trial and held a 43-second advantage at 33 km. Olano continued to pour on the power right the way through to the line to give himself a margin of comfort prior to Sunday's brutal stage, which includes a severe climb to the top of Alto De L'Angliru. The stage has been described by many riders as the most difficult they have ever seen on a major tour. Although Olano is more than capable in the mountains, he fears losing several minutes to specialist climbers such as his compatriots Fernando Escartin and Jose Maria Jimenez, who lie handily placed in the overall standings. Third place on the day, and moving up to third place overall, was the twice Spanish national road race champion Angel Casero. The Vitalicio Seguros rider started the day by announcing he was moving to the Festina team at the end of the year, having signed a lucrative two-year contract. The prospect of a secure future propelled him to finish two minutes and 17 seconds behind Olano on the day and leave him 2:54 in arrears in the Tour itself. CIUDAD RODRIGO, Spain, Sept 9 (Reuters) - Germany's Jan Ullrich, the 1997 Tour de France winner, scored his biggest victory for more than a year when triumphed in the 160-km fifth stage of the Tour of Spain on Thursday. The Deutsche Telekom rider, who has missed much of the season because of injury after crashes in the Tours of Germany and Switzerland, clocked three hours 52 minutes 56 seconds for the leg between Bejar and Ciudad Rodrigo. Abraham Olano finished second in the same time and took the race leader's golden jersey from Ullrich's compatriot Marcel Wust who had held it for the past two days. The crucial point in the race came when a 24-strong group broke away from the rest of the field coming down from the Alto del Portillo, the first premier category climb on this year's Tour, after 94 kms. The leading pack, with also included Russia's Pavel Tonkov and Spain's Fernando Escartin as well as the prologue winner and first day's race leader Igor Gonzalez Galdeano, quickly established a lead of more than two minutes over the peloton. Further back a third group including twice Tour of Spain winner Alex Zuelle of Switzerland were struggling to stay in contention. The leaders managed to maintain their advantage all the way to the line, finishing just over three minutes in front the chasing bunch of 27 riders. Ullrich punched the air to signify his return to form after a year blighted by injuries when he crossed the line little more than a wheel rim in front of Olano. His six days of riding on his debut Tour of Spain constitute his longest competitive stint in the saddle this year. ``This stage victory has come quicker than I expected,'' Ullrich said. ``My aim on this Tour was to win the two main time trials and have a good attempt to take the mountain stage going into Andorra. Olano, who holds a 10-second lead over Ullrich, said: ``I was hoping to beat Ullrich but tomorrow's another day. Now I am going to fight for every stage,'' Olano warned. Escartin finished ninth in the sprint for the line while Tonkov was 12th, both riders being given the same time as Ullrich and improving their overall positions. 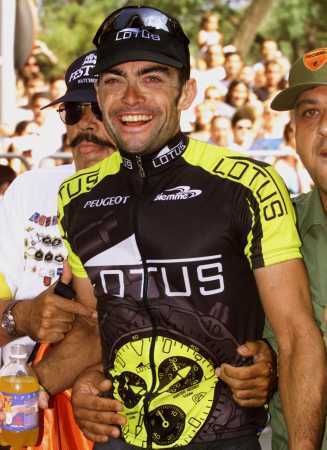 A tired Zuelle was 56th, more than five minutes adrift of the leading pair, and the Banesto rider's hopes of regaining the Tour crown he won in 1996 and 1997 have almost certainly evaporated. SALAMANCA, Spain, Sept 8 (Reuters) - Germany's Marcel Wust won his third consecutive stage in the Tour of Spain when he took the 185.6-kms fourth stage between Las Rozas and Salamanca on Wednesday. The Festina rider clocked an unofficial time of four hours 21 minutes 43 seconds after sprinting to victory over the final 100 metres, in similar fashion to his first two stage triumphs. The win consolidates his position as race leader. Wust has a provisional 29 seconds lead over Australia's Robbie McEwan. Italy's Giovanni Lombardi, of the Deutsche Telekom team, had to settle for the runners-up spot for the second successive day. FUENLABRADA, Spain, Sept 7 (Reuters) - Germany's Marcel Wust sprinted to victory for the second successive day in the Tour of Spain and the bonus seconds he earned propelled him into the overall lead on Tuesday. The Festina rider, who lives in Spain, picked up the 10th stage victory of his career in the event but it is the first time he has been the race leader in his 11 years as a professional. He covered the 229.5-km third stage between La Roda and Fuenlabrada, a town just outside Madrid, in six hours, two minutes and 50 seconds. Italy's Giovanni Lombardi, who rides for Deutsche Telekom and finished third on Monday, was again outsmarted in the sprint and had to settle for second place after the longest stage of this year's Tour. Russia's Sergei Smetanin, of Vitalicio Seguros, finished third. Lombardi and Smetanin were given the same time as the winner. ``In the sprint (on Monday) everything fell into place, I was getting a lot of help from my team. Today was a lot more complicated, more of an indidividual effort,'' Wust reflected. Wust, delighted by his successes, feels at home in the Tour of Spain, having married a Spanish woman and owning a house in Catalonia. His thunder was nearly stolen by an even more local boy -- Fuenlabrada rider German Nieto, who was born just a few kilometres from the finish line in his team's home town. Nieto surged away from the peloton after just 38 kms while the rest were content to idle along at their own pace. Nieto poured on the power and by 126 kms he had opened up a huge gap of 23 minutes and 33 seconds. Panic spread through the peloton when they realised how far ahead he was and Dutch team Rabobank decided to push the pace in a bid to get their own rider, Robbie McEwan, in a good position to take over the race lead. The Australian had picked up important bonus seconds in the intermediate sprints and moved into second place overall after Tuesday's stage. The rapidly accelerating peloton clawed back more than five minutes of the deficit in the next 30 kms but Nieto was determined to go down fighting. He continued to peddle furiously, urged on by the spectators lining the road and his team director Maximino Perez, who was contantly pouring water over Nieto's glistening bald head from the accompanying team car. However, Nieto gradually ran out of steam. The main pack finally caught up with the brave Spaniard seven kilometres from the end of the stage. Fuenlabrada's sole foreign rider, Italy's Stefano Verziagi, tried to finish what Nieto had started and attacked hard once his team mate had been caught. Verziagi made it a further five kilometres down the road before the peloton again spoiled the local team's hopes of a memorable victory. ALBACETE, Spain, Sept 6 (Reuters) - Germany's Marcel Wust confirmed his prowess as a sprinter as he won the massed drive to the line in the Tour of Spain second stage on Monday. Helped by his team mates, who allowed him to slipstream and then have a clear run for the finish, Wust grabbed his ninth Tour of Spain stage victory in his 11-year career as a professional. The Spanish-based cyclist, who rides for the Festina-Lotus team, covered the 206 km between Alicante and Albacete in four hours 46 minutes four seconds but, after several escapes were reeled in by the peloton, all the attention focused on the crucial attacks in the final kilometre. ``It's my first stage of this year's race but I hope there are going to be many more. I could not have done it without my team. I owe half this victory to my masseur,'' Wust joked. France's Jacky Durand, of Lotto, finished in the main leading group and held on to the golden jersey for a second day as no one could acquire enough time bonuses from the special sprints to knock him off the top of the overall standings. Wust reiterated the prevailing theme of the early days of this year's Tour of Spain -- that the early stages are just a prelude to when the race arrives in the mountains where the Tour winner is expected to be decided. ``This Tour is going to be very, very hard. My only aim is to survive as far as Madrid,'' Wust added. Italy's Sefano Zanini, of Mapei, finished second while his compatriot Giovanni Lombardi, who rides for Deutsche Telekom, came third. Both men were given the same time as Wust. South Africa's Robert Hunter, who won Sunday's first stage, reaffirmed his emergence as a cyclist to be feared in the final kilometres of any stage across flat and fast ground, by crossing the line in sixth place. Nearly all the riders seemed unwilling to expand any more energy than necessary on Monday, with another 19 stages still ahead of them. A 13-man breakaway group threw down the gauntlet from 27 km and there was little enthusiasm from the peloton to recapture them. It took until the 132 km checkpoint before they were finally consumed by the main bunch. As rain fell in the final hour-and-a-half of the race, Spain's Inigo Chaurreau, of the Euskaltel team, made a bid for glory just over 50 km from home. Coming down from the final climb of the day at Alto de la Muela he sped off and no one was prepared to chase him except the Italian rider Fabio Roscioli, who took 15 km to catch Chaurreau. The pair at one stage had nearly a minute-and-a-half advantage over the main group but they were eventually hauled in with four kilometres to go to Albacete. BENIDORM, Spain, Sept 5 (Reuters) - South Africa's Robert Hunter was the winner of the Tour of Spain 179-km first stage between Murcia and Benidorm on Sunday. The Lampre-Daikin rider clocked an unofficial time of four hours 38 minutes 12 seconds for the stage. MURCIA, Spain, Sept 4 (Reuters) - Spain's Igor Gonzalez Galdeano held his lead for nearly two hours to eventually become the first man to wear the Tour of Spain's golden jersey on Saturday. The Basque, who rides for the Vitalicio Seguros team, clocked six minutes 58 seconds to triumph in the 6.1 kilometres prologue time trial around the streets of Murcia after starting just 85th out of the 189 riders. Gonzalez Galdeano dared not disappear to shower and change after his thundering ride. He stood by the roadside in his cycling gear watching as the remaining riders tried to better his time, but all failed. However he was almost knocked off his place on top of the podium by local favourite and 1998 Tour of Spain winner Abraham Olano, the last man to start. Defying the drizzle that had been falling during the last of the three hours of the day's racing, Olano threw caution to the wind and finished just one second, and one place, behind Gonzalez Galdeano. ``I can honestly say I'm very surprised to have got the victory. I expected Olano to win, right down to the last minute,'' Gonzalez Galdeano said. However the amazed race leader quickly dismissed any lofty ambitions of wearing the golden jersey, which this year replaces the previous Tour of Spain race leader's yellow jersey, when the race finishes in Madrid in three weeks time. ``This race will be decided in the mountains and I'm not a climber,'' he declared. The rain and diminishing visibility as dusk fell on Murcia caused most of the leading riders to peddle at less than full pelt. They clearly decided to ease off in the increasingly greasy conditions after watching Spain's Santi Blanco, who started 148th, come to grief on the first of five sharp corners. Fortunately the Vitalicio rider was unhurt despite crashing into the barriers and remounted quickly but the effect of Blanco's accident was evident. Switzerland's Alex Zulle, of Banesto, finished 37th after coming home 15 seconds adrift of the surprise winner. Russia's Vjatceslav Ekimov was even more tentative and finished 120th, 33 seconds in arrears. However Germany's Jan Ullrich, the 1997 Tour de France winner, caught observers off-guard by arriving at the start line in a surprisingly lean condition and then showing a modicum of late season form by only losing 11 seconds to Gonzalez Galdeano and being placed 21st.